Research N Reports makes quality research that provides meaningful differences to enterprises and their customers. They offer a gamut of market reports covering various industry sectors. In-depth analysis and thoughtful segregation to a micro level maintained real-time are RNR's forte. They have recently published a new report about the global Sentiment Analysis software market where Bitext is included as a key player, among Clarabridge, IBM, SAS Institute or Lexalytics. It is titled “Global Sentiment Analysis Software Market Size, Status, Supply, Demand, Analysis, and Forecast 2018-2023”. The author analyzed that the global Sentiment Analysis software market is to grow at a CAGR of 16.16% during the period 2018-2023. The report on the global trade finance market offers comprehensive insight into the key growth drivers, notable challenges, prominent trends, recent technological advancements, and the competitive landscape. The study presents a critical assessment of the scope of key applications and the innovations in products brought about by key players. It further takes a closer look at prevailing regulatory landscape in major regions and identifies promising avenues. 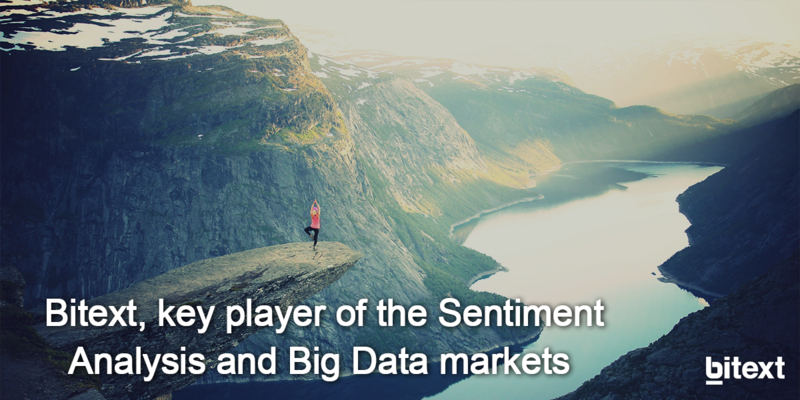 The growing demand for predictive analytics in sentiment analysis is one of the key trends that will gain traction in the sentiment analysis software market. Since predictive analytics software supports sentiment analysis software to develop accurate and efficient solutions, improve the overall efficiency of production, reduce cost, and determine trends and patterns across unstructured content, the efficiency of sentiment analysis software will further increase., which will consequently drive the demand for the software. On the other hand, this week Business Insider, the largest business site on the web, featured Bitext in the top 9 Big Data Spanish companies, as the startup responsible for the most accurate and most multilingual text analysis engines in the world, available in more than 50 languages from Africa, Asia, Europe and the Middle East.